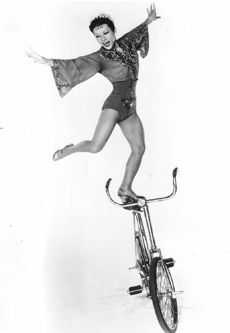 In the 1960s and 1970s, Lilly Yokoi was considered the world's greatest acrobat on bicycle. Her act was indeed technically outstanding, and the ease with which she performed it, her grace, and her unmatched elegance have survived the test of time. Even today, her act can be regarded as the greatest solo bicycle act that ever was—and it is universally acknowledged as such by all those who were lucky enough to see her perform. Although of Japanese descent, she was born in New York City in 1929, into a family of circus performers. Her parents, Eizo and Rui Yokoi, were acrobats on unicycle and bicycle who went to work in the United States in the 1920s. They had trained their four daughters, Mary, Lilly, Olga (Akimo), and Kimiko (Kimi, 1939-1990), and their son, George, in their craft. The four girls reached a remarkable technical level in bicycle acrobatics, doing tricks rarely or never seen in their time with an uncanny facility. The children worked together with their parents in a bicycle and unicycle act billed as The Yokoi Family. Then, the act was featuring only three of the the four Yokoi Sisters, Mary, Olga, and Lilly. 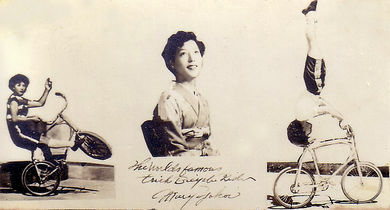 The Trio Yokoi, as they were billed, appeared on CBS's The Talk of The Town (the forerunner of The Ed Sullivan Show) in 1954. Mary was the original star of the family, but Lilly quickly caught up with her: Pretty and naturally elegant, she had a remarkable stage presence and charisma. During an engagement, she met the Swedish hand-balancer Rolando, who became her husband. She then left the family act (she was replaced by Kimi) and began working solo in 1956. (In time, Kimi would embark into a successful solo career of her own, and George would complete the trio.) That very year (1956), Lilly made her first television appearance as a soloist on The Ed Sullivan Show, which certainly helped boost her budding career. In the United States, Lilly worked exclusively in variety—from the enormous Radio City Music-Hall to Lou Walters’ intimate Latin Quarter on Times Square in New York, to tours with the Harlem Globe Trotters—but word of her exceptional talent spread out, and she was soon in high demand in Europe. There, she appeared in major circuses, such as Bertram Mills Circus at Olympia in London, Cirkus Berny in Norway, Cirkus Schumann in Denmark and Sweden, Circus Knie in Switzerland (in 1959 and 1975), among others. In variety, she was featured in some of the most prestigious venues, which included the Hansa Theater in Hamburg, the London Palladium, and the Lido in Paris—with which show she had previously appeared at the Stardust Hotel and Casino in Las Vegas. Lilly Yokoi became one of the highest paid solo performers in the circus and variety world. In his memoirs, Bertram Mills Circus — Its Story, Cyril Mills remembers: “…she was about the highest paid circus artiste in the world and having had to do battle with all the great circuses, I still had to wait two years until she was free.” And he added, “I think she was one of the greatest performers I ever engaged. She was an artiste down to her fingertips, her costumes were magnificent, and she had a smile which was so infectious that her audience was with her in the first minute.” Just before her engagement with Bertram Mills Circus in 1962, Lilly had her bicycle gold plated; she became known as "The Bellerina On The Golden Bicycle." She made numerous appearances on television. In the United States, she was introduced by host Joan Crawford on ABC Television’s Hollywood Palace, and she was featured three times on CBS’s The Ed Sullivan Show. She was also one of the mystery guests on the popular game show What’s My Line on CBS. In France, she appeared on the long-running television circus show, La Piste aux Etoiles, and in England on ITV’s The Paul Daniels Magic Show. While performing at the London Palladium in 1975, she was invited to participate in a Royal Variety Performance for Queen Elizabeth II and Prince Philip, which was also broadcast on British television: She was in the company of Dudley Moore, Peter Sellers, Jack Benny, Peter, Paul & Mary, and the French upcoming "nouvelle vague" star, Johnny Halliday, among others. In addition, Lilly was featured in Gilbert Cates's circus movie documentary, Rings Around The World (1966). In 1977, Lilly went on a fourteen-week tour of Australasia with an all-star international cast gathered by Australian producer Michael Edgley, for a show he titled The Greatest Circus On Earth. She shared the bill with such circus luminaries as the Flying Terrels, with triple somersaulter Terry Cavaretta, the juggler Rudy Schweitzer, the sword balancer Rogana, and the spectacular teeterboardA seesaw made of wood, or fiberglass poles tied together, which is used to propel acrobats in the air. act of the Boichanovi Troupe, then at the peak of their form. She was back in the United States in 1978 to tour once again with The Harlem Globe Trotters, where she took the place of her sister Kimi, now a regular of that show. 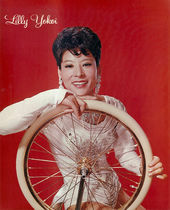 Lilly Yokoi made her last public appearance on her golden bicycle in the summer of 1982, at Blackpool’s Tower Circus in England. By temperament, Lilly was was a very private and discreet person; after her retirement, her many colleagues and admirers around the world wondered what had become of her—until her and Rolando's daughter, Monica (b.1964), let it be known in 2009 that her mother, who was then eighty-two years old, had retired in Japan, the country of her roots, if not of her birth. It came as reassuring news. Yet, Lilly Yokoi had never disappeared from the collective circus memory: She became a much admired and never to be forgotten circus legend—and to this day, she remains one of the greatest circus artists of the twentieth century.